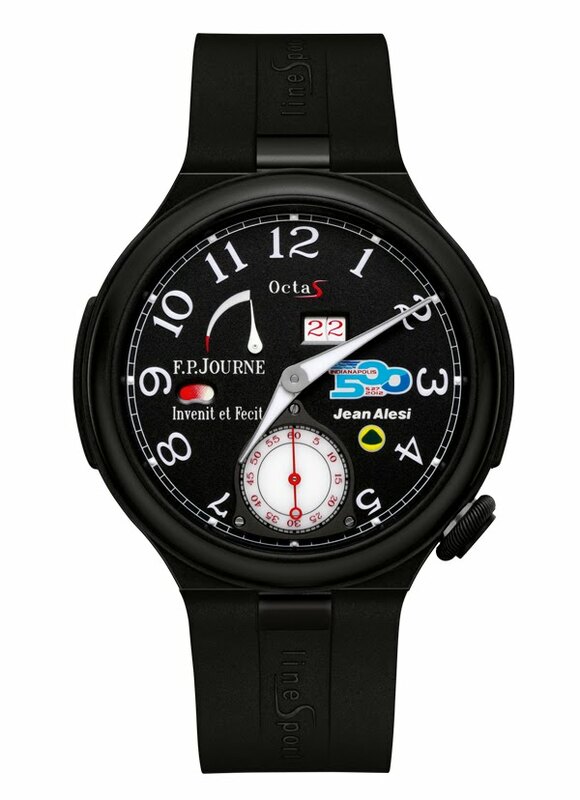 In commemoration of Jean Alesi’s participation to the emblematic Indianapolis 500 miles race, F.P.Journe has created a Limited Series of 99 pieces, the “Octa Sport Indy 500”, numbered 501 to 599. Inspired by the Octa Sport, it is produced in high technology Aluminium alloy used in the Aeronautics. The blackened Aluminium case and black dial, with the F.P.Journe Invenit et Fecit signature, featuring the logos Indy 500, Lotus and Jean Alesi, reinforces its sportive aspect and places this Limited Series in the category of watches associated with car races. A watch of an astounding lightness for absolute comfort as it only weights in its whole 53 grams. It is thought and conceived specifically for a sportive lifestyle, and coupled with an automatic movement of authentic high horology. The “Octa Sport Indy 500” offers a 120 hours power and features central hour and minutes, small second at 5h00, power reserve at 10h30, day/night indication at 8h00 and a large date at 1h00. F.P.Journe undertook long researches to find an ultra light and resistant material to receive this exceptional calibre; while maintaining the standards of high horology so specific to the F.P.Journe Manufacture. The “Octa Sport Indy 500” features the new all Aluminium alloy F.P.Journe movement reserved exclusively to the models of the lineSport. The brand also perfected different methods of processing in order to make the aluminium scratch resistant and give it anti-corrosive and antiallergic properties. The ”Octa Sport Indy 500” Aluminum alloy movement still preserves the properties of all F.P. Journe Octa calibers, with a five day power reserve and a variable inertia balance wheel for an optimum yield and an irreproachable stability. Rubber inserts are fixed with an outstanding process to the sides of the case to efficiently protect the watch from any shocks, in line with bumpers of ancient automobiles. The crown and the folding clasp, engraved with the F.P.Journe signature, are also covered with a rubber coating.